New Wave Domesticity: A Garden Giveaway! I have been so excited to garden lately & I really wanted to share that excitement with all of you! I put together a little gardening prize pack that I think would be perfect introduction for the beginning gardener to start their own container garden or a great addition to any master gardener's toolbox! I recently came across these adorable double-sided hanging planters called Splanties. They are perfect for small spaces, patios, or even fire escapes. It has a cute faux wicker look and and would be excellent to add some colorful flowers or start a little herb garden in your space. 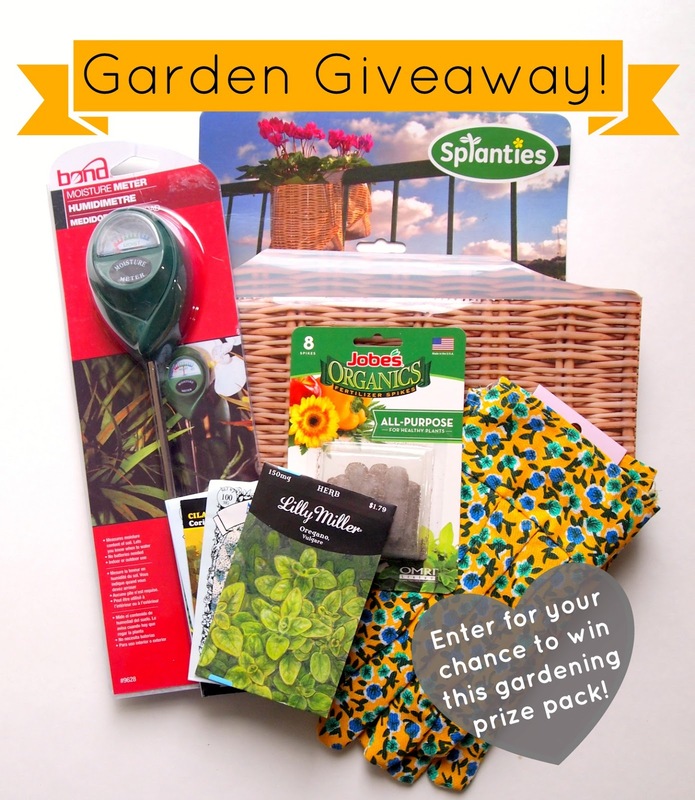 You can win a pack of 3 to get your garden started or add to your existing space! Thank you all so very much for participating & for following along! Happy gardening! I'm excited to just see what comes up on its own through the year, since I just bought my first house less than a year ago. The previous owner plated lots of things, and it's fun watching it all come up! That is so fun! Congrats on your first house! We did the same when we moved into our current house and it just made me so happy to walk around the yard and try to identify all the new little sprouts and things that popped up around the yard! I would love a container gardening pack for my apartment. I just planted a mystery plant and stuck it out by my door. I want to grow som black eyed Susans! I am excited to grow zucchini, my parents always grow a lot so now I can have some of my own too. This looks so fun! Thanks for the chance to win. That sounds dreamy! It's funny, I have a really hard time growing lettuce...it always bolts so quickly! Maybe I'm just planting it at the wrong time? I am most excited to grow ruby red swiss chard, right now the best thing growing for me! I've never grown swiss chard, but I really want to! Let me know how it works out and if you love the taste! I am most excited about the kale I'm growing. It is my favorite veggie and I just harvested some tonight for a salad. There is nothing better than eating the food you grow! I always get excited for tomatoes, any kind and all sizes! There's so many things you can do with them! I love a good summer tomato salad but I can't wait to make a big batch of red sauce from them to freeze for the daunting tomatoe-less months! I'm excited to grow zucchini this year! I can't wait to can veggies this year! Congrats on the new house! I'm really excited for fresh tomatoes and salsa and capreses salad. I love it all except the bugs. It's too wet here to plant yet, and it frosted last night. Caprese salad is my favorite! I grow lots of extra basil just so I can munch on it all summer! Do you guys have a super short growing season up there? Or does it extend a little in the fall? I always get super jealous of everyone south of me because their gardens are growing months before mine! I'd grow some pumpkins for my kids, and some tomatoes for me. Yum! That sounds lovely! What kind of pumpkins do you grow? I kind of want to try them this year! Can not wait for my tomatoes to grow, kids are waiting for the melons. Me too! I have 6 or 7 tomato plants in the ground and I am watching them anxiously. I also am growing melons for the first time this year...a moon & stars and a sugar baby. I am a little worried they might not grow so well, but it's worth a shot! What kind of melons do you guys usually grow? I'm most excited to try to grow some blueberries. I'm excited to try cucumbers this year. I just started our very first edible balcony garden. So far a few things have sprouted and I am EXCITED! That's awesome! First gardens are the BEST! I love watching the little sprouts grow, it's funny how super excited I get about every little bit of growth! ;) Good luck!! That is so cute! I bet your kids are SO excited to watch them grow! I loved that when I was little! Oh my gosh! That sounds amazing! I tried to grow blueberries one year and I failed...I think I just didn't give it exactly what it needed and it burned up. I have dreamed of having lots of fruit plants around! We are renting now, but as soon as I buy a house, I am going to invest in tons of fruit plants! Let me know how the blueberries turn out!! I'm excited to grow corn. Every year I try and some years are good, others not so good. I like to grow corn because the kind in the store is very sweet and I don;t like the sweet variety. Corn sounds amazing! If I ever have more space, I would love to try it! What variety do you grow? I'm excited to grow tomatoes and daylilies! I am planting Lavender plants and hoping they will live this time! I'm just getting tomatoes now! My watermelon didn't make it, too hot down here in Florida! For the fall I'm most excited about my sugar snap peas! I am most excited to grow tomatoes. They taste so much better fresh from the garden. Good luck! I hope they do too! My experiments with container grown tomatoes have been really awesome so far, so I hope you get the same success with them! I am most excited to grow tomatoes this year! Yum! I'm jealous that you live in a place where they grow! The Pacific NW just doesn't seem to get hot enough for them to thrive! This would be great to get some color on my front porch! I'm excited for growing my strawberries!!! I'm growing baby tomatoes this year-- container gardens on the porch... would love to win this! I'm most excited about growing some cilantro and a couple new thyme and basil plants. Usually I ttry tomatoes and they do okay and then the Oklahoma sun burns them up, I have had good luck growing potted herbs, where I can move them around.. I usually have the opposite problem in Portland...the tomatoes are sad and rained on until right about now. I do love containers though, it makes it so much easier to help the plants get exactly what they need! Have you tried growing tomatoes in a container? My container tomato is growing like crazy! I'd really like to just some beans etc. Something fairly foolproof for the kids. I like to grow Pumpkins. I would like to grow peas... I love garden peas, I would have an entire garden full of them if i could lol. I'm excited for my peas and heirloom tomatoes! We just moved to the midwest from the rainy Pacific Northwest.The only thing we could grow over there were tomatoes and some berries. I am looking forward to planting my own watermelon now that the climate allows it. I just would love to grow lots and lots of flowers. An Easy DIY Outdoor Bunting!